In January 2011, the Human Rights and Immigration Clinics began an ongoing collaborative effort to halt deportations to Haiti in view of the ongoing effects of the January 2010 earthquake, the cholera epidemic, and political unrest. This project has involved international human rights advocacy before the Inter-American Commission on Human Rights, domestic policy advocacy, and individual case representation. 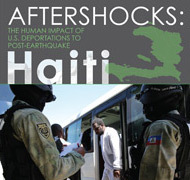 In 2015, the Immigration Clinic and Human Rights Clinic, along with other groups, worked to publish a report documenting the stories of the men and women deported from the United States to post-earthquake Haiti on account of a criminal history. Read More. On January 6, 2011, the Human Rights and Immigration Clinics, along with the Center for Constitutional Rights, Florida Immigrant Advocacy Center, Alternative Chance and the Loyola Law Clinic and Center for Social Justice filed an emergency petition for precautionary measures with the Inter-American Commission on Human Rights (IACHR) to halt the roundups, detention, and imminent deportations of hundreds of Haitian nationals by the United States government. To read a summary of the petition for precautionary measures, click here. To read the entire petition, click here. The IACHR requested that the United States respond to the petition by January 19, 2011 (see letter). The next day, the United States deported 27 men to Haiti. All of the men were detained in squalid and life-threatening conditions in Haiti under a longstanding policy of the Haitian government to detain all deportees who have a U.S. criminal record. After spending a week in Haitian jail, one of the deported men, Wildrick Guerrier, 34, demonstrated cholera-like symptoms and died shortly thereafter. Guerrier, a former lawful permanent resident, left behind a large family in the United States, including his fiancé and her son, his mother, and brothers and sisters. On February 4, 2011 the IACHR granted the request for precautionary measures. The IACHR urged the United States to suspend deportations of the five Haitians named in the petition until Haiti is able to guarantee that detention conditions and access to medical care for persons in custody comply with applicable minimum standards and until the United States has implemented procedures that take into account the deportees' human rights to life and family. To read a letter to the IACHR in support of the petition, signed by over 80 organizations and nearly 200 legal experts, advocates and others, please click here. On March 26, 2011 the Human Rights and Immigration Clinics appeared before the IACHR in a formal working meeting to argue against the resumed deportations to Haiti. To read the submission submitted by the Clinics and their partners for the working meeting, click here. The Clinics are also working in collaboration with other groups to advocate with domestic policy makers to stop the deportations to Haiti. This advocacy has involved meeting with local and DC-based government officials and helping to foster a broad coalition of advocacy groups and community-based organizations that oppose the Haiti deportations. In March, 2011 Immigration and Customs Enforcement (ICE) posted on it website a draft policy stating its intention to resume deportations. An overwhelming number of organizations and individuals opposed the policy in written comments. To read these comments, click here. To read the Sign-On Letter authored by the Human Rights and Immigration Clinics and signed onto by 280 organizations and individuals, click here. On April 1, 2011 ICE formally issued its deportation policy to resume deportations. To reach the Statement of the Clinics against this policy, click here. To read the Statement in Spanish, click here. The Immigration Clinic is also helping individual Haitian men detained in Louisiana who are facing imminent removal to Haiti by representing them in their individual cases under U.S. immigration law or matching them with pro bono counsel. Pro bono counsel interested in taking a case should contact Romy Lerner, rlerner@law.miami.edu or Rebecca Sharpless, rsharpless@law.miami.edu. Read our Guide for Haitians in Immigration Detention (December 2011). This guide explains how you can ask U.S. Immigration and Customs Enforcement to temporarily stop your deportation until conditions in Haiti improve. View Congressional briefing flyer (March 2012) with the latest updates on Haitian deportations. The Human Rights and Immigration Clinics recently contributed to a "shadow report" submitted to the United Nations Human Rights Committee in anticipation of the upcoming review of the United States' compliance with the International Covenant on Civil and Political Rights (ICCPR) in Geneva in October 2013. In February 2014, the clinic submitted an update to their original shadow report. Click here to read the update on U.S. Deportations to Haiti. "The Inter-American Commission again calls on the United States to suspend deportations to Haiti of persons of Haitian origin who have are seriously ill or who have family members in the United States, especially when those family members are children and those at risk of deportation were the family's primary breadwinners. This suspension should be maintained until Haiti can guarantee that access to medical treatment meets the minimum applicable standards." The full text of the IACHR's statement relating to the Deportation of Haitian Nationals by the United States is located in Part II of the press release available here. Read the statement presented on July 3, 2012 at the United Nations Human Rights Council by the ACLU, UM's Human Rights and Immigration Clinics, and others concerning Haitian deportations from the U.S. following the catastrophic 2010 earthquake in Haiti. The U.N.'s Independent Expert on human rights in Haiti, as well as UM Clinics and South Florida immigration advocates, have renewed their call on the United States, Dominican Republic and others to halt deportations to Haiti. To learn more, click on the links below. Clinic students attend working meetings before the Inter-American Commission on Human Rights on Deportations to Haiti. Human Rights and Immigration Clinic students attend Congressional briefings on Haiti deportations in Washington DC. Clinic students urge Washington DC officials to stop Haiti deportation. Supervising attorney and Immigration Clinic students stand outside a Louisiana jail where Haitians are detained. Clinic students Nneka Utti, 2L, Tom Oglesby, 3L, Lea Dartevelle, LLM, and Niyala Harrison, 2L worked on the petition on behalf of detainees from Haiti. Wildrick Guerrier, age 34, died after being deported to Haiti on January 20, 2011 and detained by Haitian authorities. Clinic Director Rebecca Sharpless speaks at a news conference alongside the fiancée of deceased deportee Wildrick Guerrier. For additional Immigration Clinic news releases & media coverage, click here. For additional Human Rights Clinic news & media coverage, click here.